Bahrain’s most prominent human rights defender, Nabeel Rajab, who is the President of the Bahrain Center for Human Rights (BCHR), is being detained in Jau Prison since his initial arrest since June 2016. The ongoing judicial harassment against Nabeel Rajab includes three cases against him on several charges. All of his charges relate to the exercise of his freedom of expression, including for comments made on Twitter, during media interviews and in opinion articles. On 6 June 2018, the Council of Paris has unanimously awarded honorary citizenship to Nabeel Rajab, in recognition of his fight for freedom, democracy and human rights. The ceremony took place on the 18 June 2018. 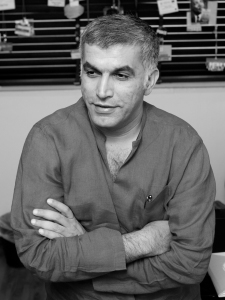 On 14 June 2018, the European Parliament adopted Resolution (RC8-0281) which strongly condemns the crackdown on human rights in Bahrain and calls for Nabeel Rajab’s immediate release. On 15 August 2018, The United Nations (UN) Working Group on Arbitrary Detention has issued a formal decision declaring Bahrain’s imprisonment of human rights defender Nabeel Rajab unlawful. Nabeel Rajab is being arbitrarily detained under eight articles of the Universal Declaration of Human Rights and seven articles of the International Covenant on Civil and Political Rights, according to the Working Group. This is “in violation of the rules of international law may constitute crimes against humanity”. On 8 October 2018, Nabeel Rajab was shortlisted for the Václav Havel Human Rights Prize, which is bestowed upon those who deliver outstanding commitment and action in the defence of human rights, both in Europe and internationally. “Spreading rumours in wartime” and “insulting a neighbouring country”, under articles 133 and 215 of Bahrain’s penal code, for comments criticising the Saudi-led war in Yemen, of which Bahrain is a member. These charges carry up to ten years and two years respectfully. “Insulting a statutory body”, under article 216 of Bahrain’s penal code, for allegations of torture by security forces in Bahrain’s largest prison, Jau. This charge carries up to a two-year sentence. On 28 December 2016, the judge authorised Nabeel’s release on bail. However, he was immediately re-arrested and detained for an investigation into a second case, related to media interviews. On 21 February 2018, Nabeel was sentenced to five years in prison for his tweets, and by December 2018, he would have already spent 30 months in prison. The prosecution did not begin investigating his charges until six months into his detention, in December 2016. On 5 June 2018, the Bahrain High Criminal Court of Appeal upheld the five-year sentence for the tweets criticising the airstrikes in Yemen. Nabeel Rajab has been charged with “spreading false news”, under article 134 of Bahrain’s penal code, in relation to media interviews he gave in 2014-15. According to the prosecution, these charges related to comments given during media interviews, in which he stated that foreign journalists and international NGOs cannot enter Bahrain and that the imprisonment of opposition actions was political and illegal. Nabeel Rajab’s statements for which he is being prosecuted were not without evidence. Campaign group Bahrain Watch has documented Bahrain’s denial of entry to journalists, academics and NGOs since 2011. People who have been denied entry include members of Human Rights Watch, Human Rights First, Reporters Without Borders, and journalists including Pulitzer Prize winner Nicholas Kristof. On 10 July 2016, he was sentenced to two years in jail by a Bahraini court after finding him guilty of “disseminating false news, statements and rumours about the internal situation of the kingdom that would undermine its prestige and status”. On 15 January 2017, Bahraini Court of Cassation denied his appeal against his two-year prison sentence for communicating with journalists. Nabeel has therefore exhausted all legal remedies. On 3 September 2016, the New York Times published a letter which Nabeel wrote from jail. The following day, authorities charged him with “spreading false news” under article 134 of the penal code. Rajab was also questioned by the prosecution after another letter appeared in the French paper Le Monde in December 2016, but on this occasion, he was not charged. A second NYT article has since been published. Nabeel Rajab faces another set of charges for supposed social media posts he made in January 2017, while he was in custody without access to social media. The charges were first brought against him in September 2017.